“Not happy with your life? Do something to change it. Start small, be brave , and be happy. Your happiness (or unhappiness) is all up to you and no one else”. I wasn’t happy for a long time. I didn’t know why. I didn’t understand why. I had no idea how it happened and if it was ever going to get better. I had many dark days. Many days where I really thought that this was it. This was how it was going to be. This was how my life was going to be for the rest of my life. Why was I so unhappy? I had never felt this way before. It was strange, it was confusing, it hurt. The first few weeks after my baby arrived were undoubtedly the best weeks of my life. I had made a tiny human and he was perfect. He had a perfect little nose. Perfect little toes. A perfect little baby noise. Our family was complete and it was really, truly perfect. So why when he was two months old did everything suddenly seem wrong? I hid away all the time. Going outside was near impossible. I had always thought that PND happened pretty much as soon as the baby popped out. I never thought it could have happened that much later on. I never thought it could have happened to me. Hiding away my feelings made everything 10 times worse . And I was to blame for it. I was to blame for everything. I made myself unhappy. I didn’t talk. I didn’t open up. I mean, who really wanted to talk to me about my mundane problems ? No one wanted to hear that. I didn’t even want to hear about it , especially out loud. I had so many people around me that offered so much support. And eventually I took it. My friends and family have been , and are all amazing. Without them I don’t think I would be where I am today. My partner has been my absolute rock. He has helped me overcome my bad thoughts , my bad days. And I can now be brave enough, be confident enough to open up, be honest and talk . Not just to him, but to anyone. And it was the best thing I could have ever done. 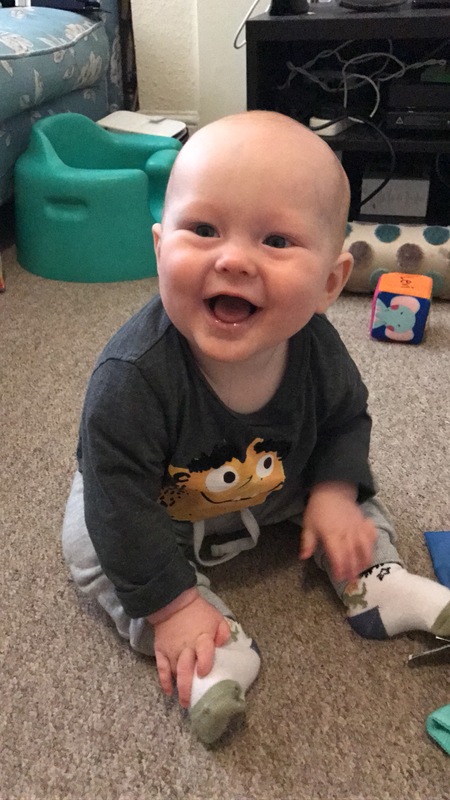 My little solider is nearly 9 months old and I can finally admit that I am better. I am happy. It’s so hard to admit that I have a mental health problem. Because some days I still don’t really believe it. It’s still there, niggling at the back of my mind. But it’s at the back, and when it creeps forward a bit. I have to talk about it. I have to beat it. I’m happy . And I’m going to stay happy. It’s been a long journey. It’s been a tough journey. But I’m nearly there. My baby boy is the most beautiful thing in the world. He makes me so, so happy. I make him so, so happy. We have the best time together ever. And these times make me forget the bad times. I mean, I’ll never forget what happened. It’s all been a part of our journey together. And it’s made me the Mum I am today.